BANGKOK (AFP) – Thailand's prime minister said the nation's powerful military and its revered monarchy should stay removed from politics as the country moves on from its worst civil unrest in decades. Both institutions have played active roles in the turbulent politics of the kingdom, which was rocked by two months of anti-government "Red Shirt" protests in Bangkok that turned deadly, ending with an army crackdown in May. Prime Minister Abhisit Vejjajiva, accused by critics of being a "puppet" for an unelected Thai elite and the army after he came to power in 2008 with military backing, stressed his political independence during the recent crisis. He said the army, which has staged 18 attempted or actual coups since 1932 -- most recently in 2006 when the Reds' hero Thaksin Shinawatra was ousted as premier -- should play a lesser role in ensuring stability in the future. "When at the moment we have to rely on the military when there are protests, when there is unrest, I would hope that in future that the police would be equipped to do this kind of thing," he said in an AFP interview at Government House. "I hope that the military will continue to respect the constitution and the parliamentary system... and that it would only obey orders from the government that are in accordance with the law." The British-born, Oxford-educated head of the establishment Democrat Party said Thailand's wounds had "not yet" healed from the 2006 putsch that removed Thaksin. He also brushed off rumours in recent months that the military had been ready to launch another coup if the government could not end the protests. "The fact that it didn't happen despite some people talking and perhaps expecting it to happen, shows that so many people and maybe all sides are quite determined to avoid one," the 45-year-old said. The Red Shirts accuse Abhisit's government of being elitist and undemocratic, after he came to power in a parliamentary vote rather than through a popular mandate, following protests by the royalist "Yellow Shirts". Ninety people were killed and nearly 1,900 were injured in violence triggered by the Reds' recent rallies seeking immediate elections. Abhisit, who does not have to go to the polls until the end of next year, had proposed during the protests to hold November elections in a bid to end the tense standoff, but now says a vote is unlikely until 2011. 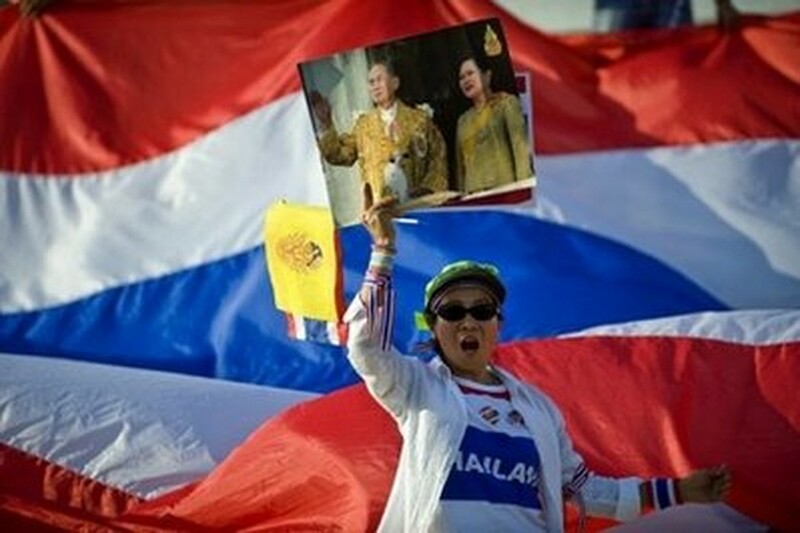 During the unrest, protest leaders called for the intervention of King Bhumibol Adulyadej, the world's longest reigning monarch. He is currently in hospital and has made no explicit public comment on the situation. Though he has no official political role, the 82-year-old king has been a stabilising force in Thailand, effectively bringing violence to an end in a 1992 uprising by admonishing military and protest leaders in a live television broadcast. Abhisit said the government's position "had always been that the monarchy should remain above partisan politics" and he denied speculation that the palace had sought to influence his administration during the recent crisis. "I can definitely say, categorically, that all the decisions during the protests were taken by the government. The palace does not interfere in the matter," he said. "The institution plays the same role as in other constitutional monarchies." But Thailand's monarchy is probably more protected than any other in the world and it remains one of the most sensitive subjects in the kingdom. Rights groups and academics are concerned about the increasing use in recent years of Thailand's strict lese majeste legislation, which criminalises any insult or defamation of the royal family, punishable by up to 15 years in jail. Abhisit said a new advisory board set up by the government in December would set a framework for people to better understand their rights of freedom of expression surrounding the monarchy. "The problem I think has been because there is so much reverence on the part of the people of Thailand for the monarchy," so police and others feel under pressure when complaints are lodged under the legislation, he said. "We have to make a distinction between people who make comments on the monarchy, maybe academic discussions, from people who clearly show intent in terms of undermining the institution, which would be a threat to national security," he added.